I read another tale, the Romanian "How the Waterfall Came to the Thirsting Mountain," that also celebrated and almost deified a long head of female hair. In this tale the Old Man of the Mountain begs a Fairy to bring him a waterfall for a mountain. The fairy travels the world and finds a Princess who was about to give her long, beautiful hair to a Wizard in return for her father. The Fairy told the Princess not to surrender her hair to the evil Wizard, but helps her to free her father (the Wizard is powerless when he sees the Tear-maiden that was born of the Princess' weeping, for none who saw the tear maiden could be anything but melted with compassion). 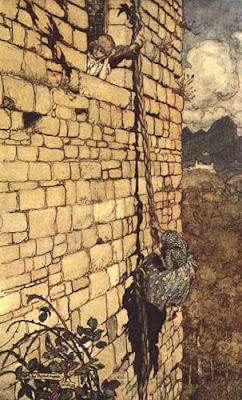 In thanks, the Princess offered the fairy a token of thanks, and the Fairy requested her hair, for the Fairy had seen "how the Princess' beautiful hair waved and sparkled in the sunlight, and when the wind blew a single thread away, it...turned into a strand of glistening dew drops." With the whole head of hair, then, the Fairy was able to give a waterfall to the Mountain. This reminded of the Swedish story I posted not too long ago in which a single strand of the heroine's blonde hair shines so brightly that it stops the evil magician from keeping young women as captives. I remembered Marina Warner in From the Beast to the Blond: On Fairy Tales and Their Tellers. She has two chapters on the language of hair, and traces examples from mythology, church tradition, medeival literature, and beyond in which long blonde hair is coveted as the sign of pure beauty. Blondeness has associations not only with light and goodness and purity, as seen in "The Magician's Cape," but also of wealth because of its similarity to gold. Not only that, but hair is also very symbolic of the duality between human and animal. Hair is a similarity between ourselves and animal fur, but can also be an expression of human individuality. In Warner's words, "It is hair's imperviousness as a natural substance that yields the deeper symbolic meanings and warrants the high place hair plays in the motif repertory of fairy tales and other legends...it can be cut and curled, sizzled with hot tongs, steeped in chemicals and dyes without apparant suffering, and will go on growing, and is not even stopped by death...such quasi-magical properties make is a symbol of invulnerability." If someone mentions the subject of hair and fairy tales, the most obvious association is Rapunzel, but hair factors into other fairy tales as well. Snow White is the only traditionally dark-haired princess because of a specific wish of her mother's; in this case the dark hair serves as a contrast to her white skin and therefore keeps in the tradition of fair/light representing that which is desirable. 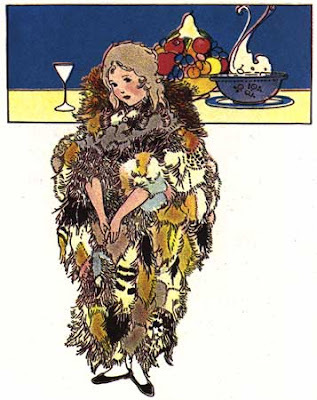 Allerlieurah from the Grimms covers herself with fur, or animal hair, to hide herself after her father attempted to violate her, and it is while brushing her hair in her natural state that she is discovered by the prince. 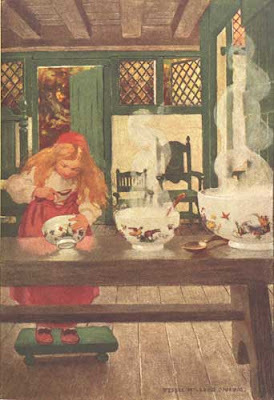 Then there's Goldilocks, and Warner reminds us that in the history of the story, the main character's transformation from old meddling woman to adorable, sympathetic child was simultaneous with her hair's progression to blonde-Goldilocks has to be good, Warner claims, to live up to her blonde hair. Illustrators have assumed that fairy tale princesses with no given hair color are blonde throughout history as well. 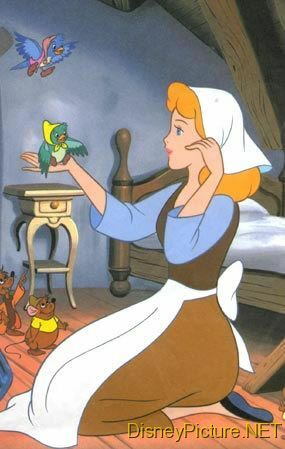 Cinderella especially is blonde except for a few very rare exceptions. Though some modern interpreters are starting to challenge the blonde stereotype, such as Disney's Belle, "their attempts lever feebly against the long weight of the tradition." Welcome to Tales of Faerie! I'm Kristin, your host. I'm a fairy tale nerd who wanted a place to remember the fascinating things I learned so I created this blog in 2010. I'm not an expert but I love discussing various fairy tale issues with readers and bloggers from around the world! What happened to the children of Hamelin? She is a panpipe player and enchantment singer. She lives in places hexed and tainted by black magic. She is only seen in the light of a full moon. She wears black feathers and rose petals. She has gentle green butterfly wings.